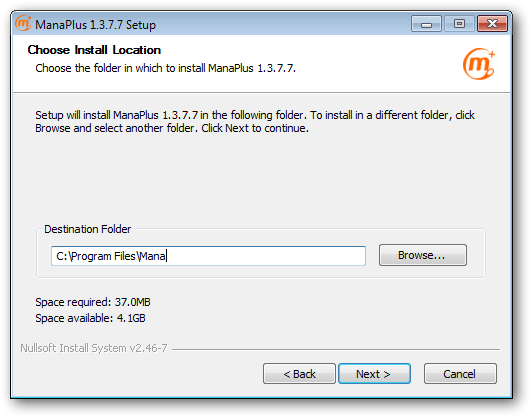 Note: Screenshots in this page refers to version 1.3.7.7, but applies to current version of ManaPlus installer. Download client here and save in your disk. Now, you can start to install. To do that, go to download directory and run executable file downloaded. If you are Windows 7 user, you will need to provide administrator permissions. 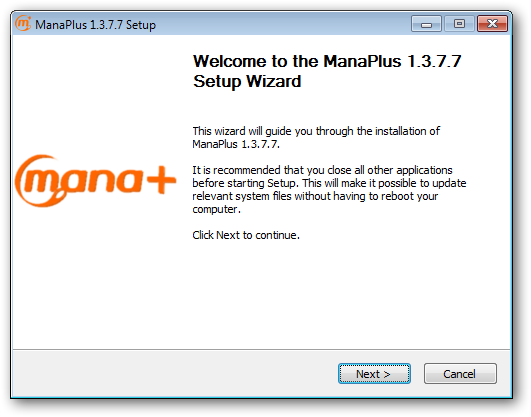 To do this, you must start the installer by right-clicking on the installer and select “Run as administrator”. You might display a security warning to run the installer, give to Run and continue the installation. 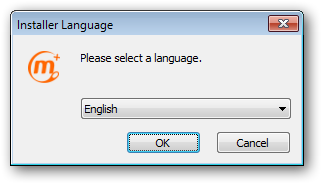 Choose the language for installation program. 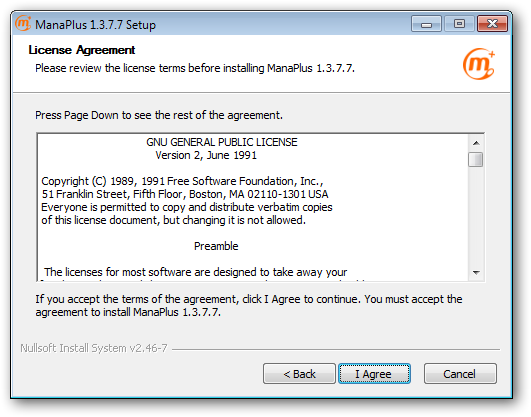 Read license and click on I Agree. By default it is installed in the directory shown following1). You can change it by typing the path directly or click Browse …. 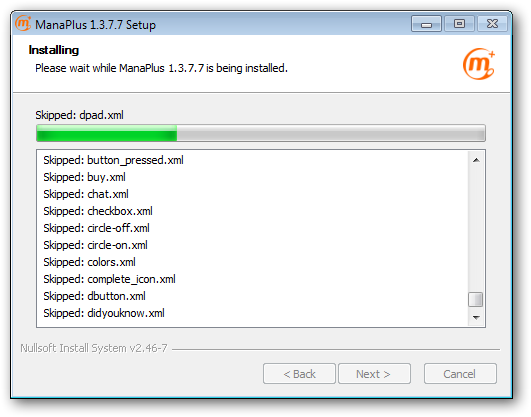 ManaPlus is now installed completely. 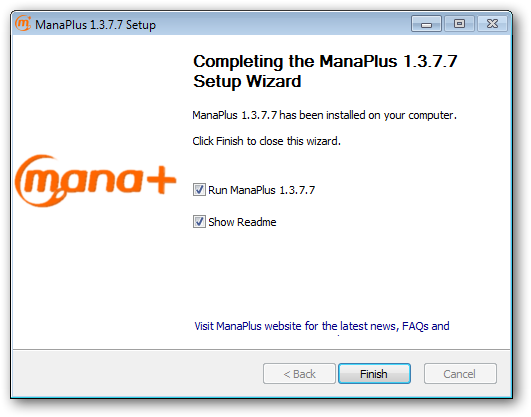 By default, after the installer finish and exits, “Readme” file is open and run Manaplus. Deselect the checkboxs if you want to change this behavior. Click on Finish to complete the installer. 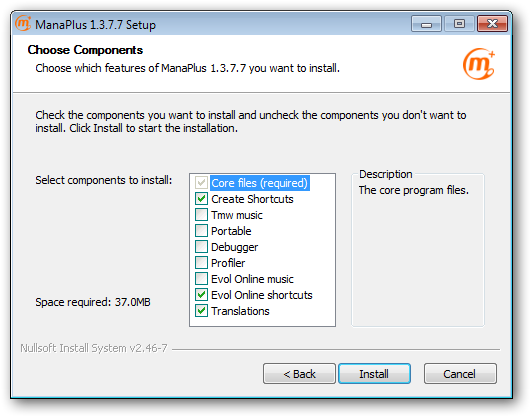 ManaPlus is now installed! Have fun experimenting last features on ManaPlus. Remember, you must have write permissions in the directory you select. If you have not, click on Cancel and restart installer with administrator permissions. In Windows 7, this is accomplished by right-clicking the executable and select Run as administrator. You may need to provide another user with administrator credentials. If you update your version don’t select portable if you want to get your client running with your customs setting: windows location, outfits, shorcuts, spells, etc.